Another day, another Autobot revealed from Transformers 4, the final film in the franchise for director Michael Bay before handing off the blockbuster series to another filmmaker. We've already seen two all-new Autobots along with a redesign for Optimus Prime, and there's also a new/old vehicle form for Bumblebee as well. Now Bay has taken to his site again to unveil the Autobot Hound. 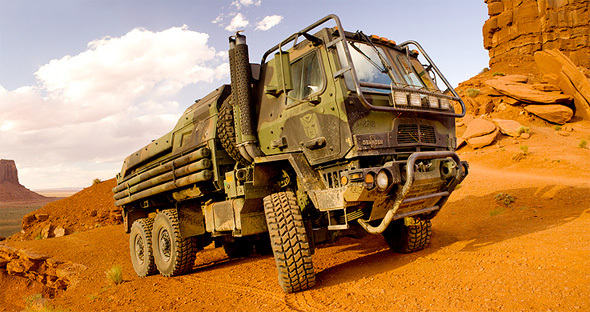 Usually depicted as a Jeep, Bay describes the character as "The always rugged and reliable Hound, one of the Family of Medium Tactical Vehicles from Oshkosh Defense." Wonder what kind of weapons Hound may be hiding in the back. Yea since Optimus Removed Megatrons Head & SPINE from his body. Shockwave was killed in the last one. Double face palm! Totally forgot that. Probably he will be back. And probably as Galvatron. Maybe some actual transformers would be nice for once. finally a badass truck. they need a bronco. Although I hope the film does well, I'm finding it hard to get excited by a fourth go. Good for you, Bay. Another Transformers movie, another bunch of rubbish cars that have nothing to do with the original designs of the Transformers, just so that you can *modernise* their look. You could've stuck with current military jeeps...even if you went for a Hummer, that would've looked better than a vehicle that has absolutely no relevance to the character of Hound. I know that I'm just going to loathe this latest movie. Bring on the reboot is all I can say. I agree. I'd rather see a reboot. can't wait to see Voltron in this! Do the robot forms still look like pincushions?